What has now become one of my favorite places to get sushi, used to be just a nearby restaurant. A restaurant that was so close, I could basically arrive to its front door in a matter of moments – without one bit of driving. A restaurant that was on my list to try for years and for some reason, I never got to it. This restaurant has now provided my taste buds with some fabulous sushi. This restaurant is known by two, simple two words – Sushi Thai. 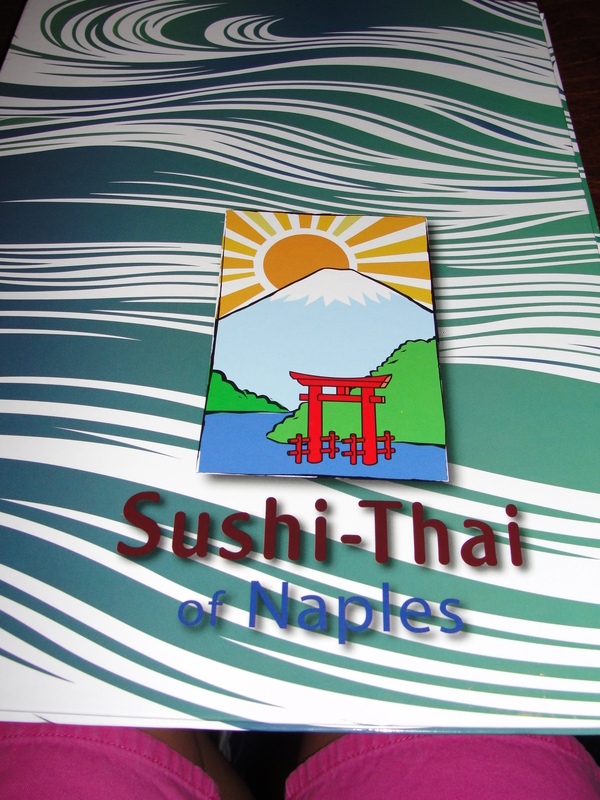 Sushi-Thai is a local Naples restaurant with a few locations throughout the town. One of these locations happens to be located in a plaza a few moments from my house. As I mentioned, this was one of those places that was always on our list to try but for whatever reason, we never did. Luckily, we now have tried it and it has quickly become a great place for great sushi. I love to try different kinds of sushi. I am game for pretty much anything. I have now tried four different types of sushi from Sushi Thai but, let’s just discuss the Red and Yellow. That is the Red Dragon Roll and the Yellow Dragon Roll. Two delicious creations that have had a party in my mouth. On more than one occasion. Once you pop, you just can’t stop. 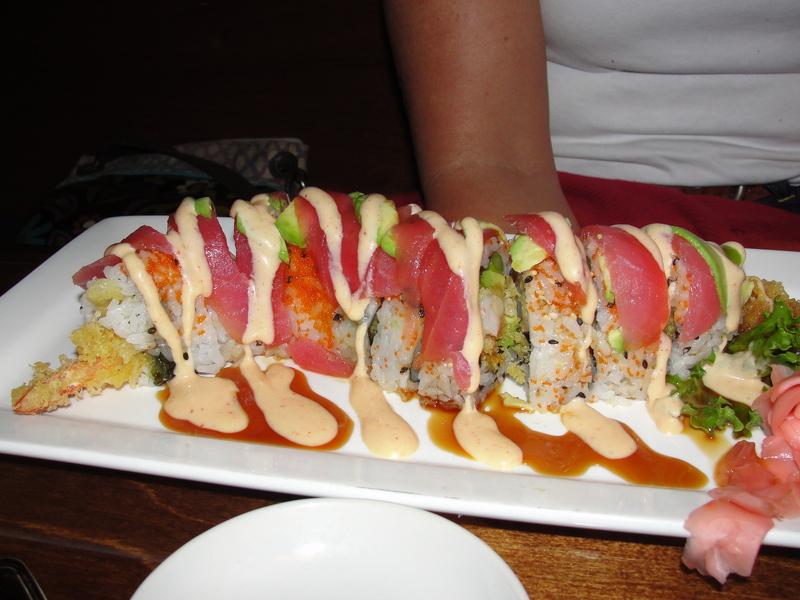 The Red Dragon Roll consists of a Shrimp Tempura Roll with Tuna and Avocado on top. This was my first time with sushi containing shrimp tempura. I did not think I would like it at all but was pleasantly surprised that I did. The biggest thing about Sushi Thai is that they serve up huge rolls. I mean the diameter on these suckers are like double the usual size. This results in a very awkward large bite where you keep your head down and hope no one is starring at you wondering why you are shoving your face. Good thing is, they are doing exactly the same thing. Every aspect of the Red is great. The shrimp within the roll is obviously tempura shrimp and is quite tasty. It is warm but not overly hot. 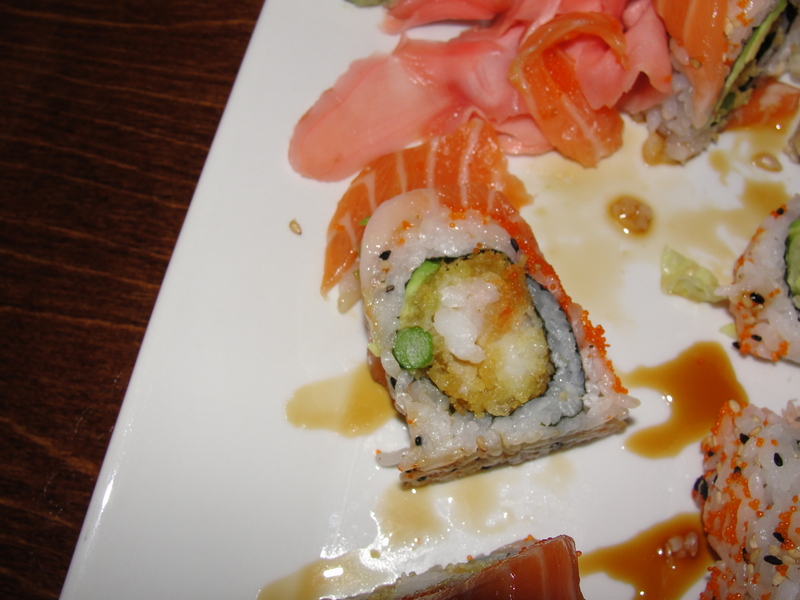 Also contained within the roll is a piece of asparagus, avocado and scallion. None of these flavors stood out on their own – good thing because asparagus is pretty gross – but, they all worked well together. Each component played its part in producing a great roll. The rice and seaweed wrap were also both good and tasty. The tuna slice on top of the roll was thin and provided the perfect flavor to the roll. It didn’t really change the consistency which did surprise me. The avocado on top, while not a lot, provides that familiar smooth avocado flavor and taste. I also really love the spicy mayo that they use. The consistency is very thin and the flavor is not at all spicy. I love the sweetness of the mayo and how it works so well with the roll. Red is a winner. There is really only one difference between Red and Yellow. On Red, you get a piece of tuna on top & spicy mayo. On Yellow, you get a piece of salmon on top and no spicy mayo. I do not in any way, shape or form like salmon. But, luckily the salmon piece is on top and is easily removed. This is exactly what I do and then I proceed to eat and enjoy the roll. Taylor and Mommy both like salmon so none of my removed salmon goes to waste. The only bummer about the Yellow is that it normally does not come with the spicy mayo. This can easily be resolved by asking for some spicy mayo on the side. Doing this allows you to basically douse the roll in the sauce and allow your mouth to have a party. Even without the added fish on top, the yellow roll is fabulous as well. The only bad thing about these rolls is the end piece which has the shrimp tail on it. I’m pretty sure it’s okay to eat but, I’d rather just pass. Yellow too is a winner. I am still somewhat baffled as to why it took so long for me to get to Sushi Thai. Eating in restaurant is great with fantastic service and take out provides the same quality sushi. The portions are a good size but, they are somewhat pricey. 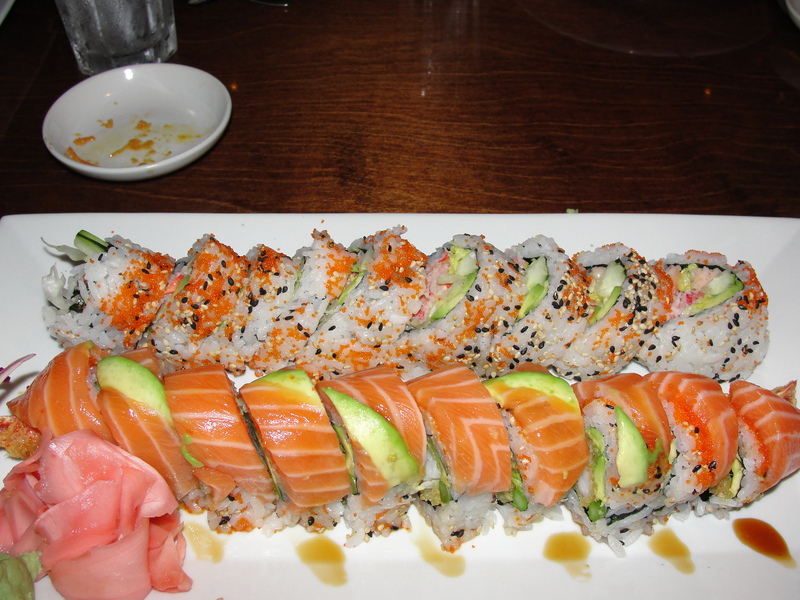 And of course, when you eat like me, you need two rolls all to yourself…yeah, I’m a beast. The high prices are really the only beef I have with Sushi Thai. The quality of the product is so high, and the flavors are even higher, that you sort of forget about the price. So whether it be Red or Yellow or, in my case, Red and Yellow, Sushi Thai cannot be missed.